Tax season is here and opportunists are again determined as ever to victimize wage earners, steal their identities and much-anticipated tax refunds. Your Social security number, name and date of birth – that’s all a scammer needs – as easy and as low risk as that. Once they have a Social Security number in hand, the scammers can file a phony tax return in the victim’s name, claim a large refund and have it sent to a false address. Last year, the IRS caught more than 1.8 million fake tax returns and prevented more than $12 billion in fraudulent refunds. It is estimated that about $21 billion in fraudulent tax refunds over the next five years can even be issued to scammers. This entry was posted in nuisance calls and tagged identity theft, IRS, nuisance calls, tax refund scam, tax scam on Monday March 24th, 2014 by Grace. The tellows app caller identification for Android and iOS – the smartphone app to identify nuisance callers! With the tellows app, you can now identify unknown callers! The app will tell you real-time if the call is trustworthy or not. 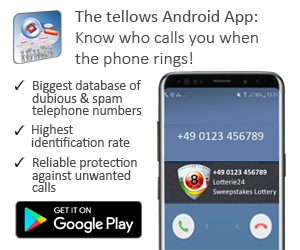 On the first ring of your phone, the tellows score will appear in order to help you decide whether to answer the phone or cancel it – 7 to 9 being the most untrustworthy numbers. The app also allows you to read the comments of users about this number. Post your own complaints through this app so you can also warn others. The service is free of charge. The only requirement is of course, aside from internet access, is an Android Smartphone or an iPhone. This entry was posted in App and tagged caller identification, nuisance calls, tellows app on Thursday March 20th, 2014 by Grace. Based on reports from consumers and federal agencies, the Better Business Bureau identified Obamacare as the most used scam method for 2013. The complexity behind the newly approved Affordable Care Act brought a lot of confusion among Americans, which in turn, opened a lot of doors to scammers and fraudsters as a way to fool citizens into sharing their personal information, and stealing their money. tellows also received reports related to this matter. I don’t know how to place this number, but I just received a call from it and a pre-recorded message said that they were from America’s Next Generation and then they went on to talk about Obamacare. I don’t know exactly what their agenda is, but I didn’t wait to figure it out. After a minute or so I hung up because whatever they were trying to sell me (literally or metaphorically) I wasn’t going to buy! Recently received a call from this number. It was a political call, although I’m not quite sure what kind of political movement or group they belong to. An automated message identified the caller as America’s Next Generarion (even though I never heard of the group nor am I aware of what I ever did to “deserve” these kind of calls). They just kept talking about Obama care. Never pay upfront fees. If someone asks for money to help you shop for insurance, it’s a sure sign they’re not legitimate. Real navigators provide information about the ACA for free. Hang up the phone. Don’t press any buttons or return any voicemails, period. Never click any links provided in e-mails. Even if it appears to be a legitimate link from a trustworthy source, type in the URL yourself. Be suspicious of anyone claiming to represent the government. Government agencies typically communicate only by mail. Don’t provide personal information such as your Social Security or bank account numbers. If you do give out such information, immediately inform your banks and credit card providers. Don’t trust caller ID. Phone numbers and organization names can be faked. Go to www.healthcare.gov. It’s the official shopping place for qualified health plans. Report scams or suspicious activity. You can file a complaint with the Federal Trade Commission at www.ftc.gov/complaint or call 1-877-FTC-HELP. If you think your identity’s been stolen, visit www.ftc.gov/idtheft or call 1-877-ID-THEFT. This entry was posted in knowledge and tagged ACA scam, affordable care act, card details, customer data theft, Harassment calls, identity theft, obamacare scam, Scam, telephone scam on Friday February 21st, 2014 by Grace. From 2000 to 2010, there were nearly 14 million immigrants who entered the United States. The US is basically accepting more legal immigrants as permanent residents than all other countries in the world combined. For these immigrants, at least for most of them I’m sure, American dream signifies new opportunities, a new world and a new life. But then statistics leads us to having this huge immigrant population in the US as one of the most lucrative markets for the scammers. Immigrants or those who are still applying for an immigrant status could be naive, vulnerable, and still less informed about the country’s legal system. Scammers would claim he is connected with the United States Citizenship and Immigration Services (USCIS), “spoof” the victim’s telephone Caller ID system to display that the call originated from USCIS, ask for the social security and passport numbers, dates of birth, etc., and scare the victim by saying that there are some problems in his immigration records. The perpetrator would then convince the victim to pay a certain fee to process his records and threaten him with deportation or application/petition denial if the victim refuses to pay. There have been similar reports in tellows regarding this matter. 0016466166770 was reported to be asking for a legal fee for an immigration lawyer. I got a call from this number saying she is processing a visa. she is asking for any debit card or credit card last 4 digit number in order to open the application. Those applying for visas, green cards and employment authorization are also being scammed by „businesses“ promising faster and sure way of getting applications approved. Scammers also use fake websites offering step by step guidance on completing a USCIS application or petition that claim to be affiliated with USCIS. Others even ask for payment to download forms, instructions or other information. As advised by USCIS, seek assistance from the right place and people that are authorised to help. Applying directly with USCIS can give you the same result without extra charges and fees. Trust only the official website of USCIS with free downloadable documents. Report such scams to the Federal Trade Commission at www.ftccomplaintassistant.gov and your appropriate state authorities. This entry was posted in general and tagged con artist, green card scam, immigration scam, scam artist, scam method, spoofing, telephone scam, USCIS, visa scam on Thursday February 13th, 2014 by Grace. Two consecutive incidents happened recently in Massachusetts subjecting two mothers under terrifying situations allegedly involving their kids. Theresa, a mother from Revere, received a call in the middle of a snow storm in December. The caller said his cousin has the pistol to her daughter’s head and that they would kill her if she will not cooperate and follow their instructions. “He said, ‘Listen to me carefully, I have your daughter.’ He knew everything about her,” says a Revere mom named Theresa. The caller was asking for $1,000. Similar incident happened to Laura while she was at work Monday last week in Lynnfield. She received a call informing her that her 14-year old son damaged his car in an accident and that he would be shot unless she transfers $2,000. In both situations, the scam artists knew about the victims’ family details, like names, the kids’ school, outfit and physical apperance of the “alleged” kidnapped son and daughter. This entry was posted in general and tagged con artist, fraudsters, Harassment calls, kidnap phone scare, lynnfield phone scam, phone scam, revere phone scam, scam artist, western union scam on Friday February 7th, 2014 by Grace. You received a call at 9 in the evening. It sounded official. Caller said he’s working with the power of an attorney and is affiliated with a credit bureau. He went on to saying that you are committing a crime by not paying the debt and threatened you with lawsuits and arrests. Now he starts to harass you and calls even at work, giving complete information about you and your family! Yes, it’s just a bluff. These scammers don’t have any power over you. You are just one of the many targets, just like our fellow tellows users below who also experienced the same thing. This entry was posted in the Most Wanted and tagged 920 ATT credit scam, debt collection, debt collector scam, Harassment calls, Most Wanted, Scam, telephone scam, top 3, weekly update on Thursday February 6th, 2014 by Grace. Let’s try to review the facts and take a look at some important guidelines set by the Federal Communications Commission on telemarketing and autodialers. 1. Telemarketers are REQUIRED to give his or her name, company, telephone number or address where he or she can be contacted. You should expect these details on the initial part of the call. In the tellows Call Guideline, you are given a script with a set of questions which you can use to verify information about the telemarketer. 2. No phone solicitation/ telemarketing is allowed before 8 am or after 9 pm. 3. As soon as you ask the telemarketer to include you in the do-not-call list, they should comply and you shouldn’t be receiving any more calls from them! At least for the next 5 years (read below). 4. The telemarketer must honor your do-not-call request for five years and you must repeat your request once you get the same call after the period. This entry was posted in general and tagged autodialers, dnc, do-not-call list, FCC, nuisance calls, Telemarketers, telemarketing, telephone numbers, telephone solicitation, weekly update on Friday January 31st, 2014 by Grace. 1. Federal Communications Commission (FCC) has consumer advisories on international and text message scams. 2. The Federal Trade Commission (FTC) provides information on phone scams and spam. 3. The National Fraud Information Center (NFIC) and the Better Business Bureau (BBB). 4. All major U.S. wireless companies can help you with their spam blocking technologies. And so this week for our top 3, we have a Spanish autodialer with 11 comments and 2085 search requests; we have a spammer looking for k.smith because her debit card has been locked, and lastly, we have our resident caller telling you to claim your Royal Caribbean or Carnival Cruise prize. Remember guys, don’t fall for it! This entry was posted in general and tagged cost trap, debt collectors, Harassment calls, Loan scam, Most Wanted, nuisance calls, Scam, scam artist, telephone scam on Thursday January 30th, 2014 by Grace. Make your smartphone even Smarter with the tellows Android app! Receiving a lot of unwanted calls lately? Seems like your DNC isn’t working? Well, we finally have the solution for you! You can now download the tellows Android app for caller identification. It’s a sure way to a peaceful life! The app will tell you real-time if the call is trustworthy or not. This will save you time since you don’t need to check the number in the internet. 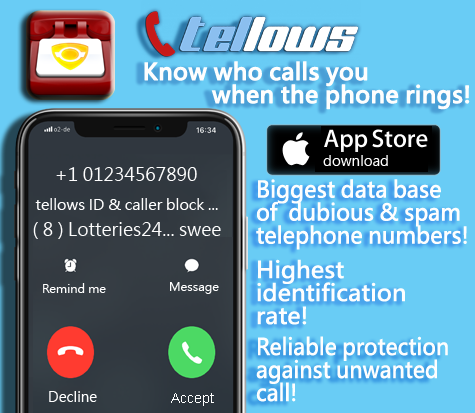 On the first ring of your phone, the tellows Score will automatically appear in order to help you decide whether to answer the phone or cancel it – 7 to 9 being the most untrustworthy numbers. Caller identification has never been this easy! This entry was posted in general and tagged Harassment calls, know who calls you, Most Wanted, nuisance calls, Scam, spam call, spammers, tellows android app, tellows app on Friday January 17th, 2014 by Grace. I remember this Hollywood film Compliance, I couldn’t sleep after watching it. It’s about this prank caller who phoned the manager of a fast food chain and introduced himself as a police officer. He asked the manager to strip search one of her female employees because she allegedly stole something. The manager believed it and followed everything the caller asked her to do. The scam call ended up as a sexual harassment case. This film is based on a true story and apparently, there were over 70 similar incidents that already occurred in 30 U.S. States. After seeing this movie, you will never again talk to strangers! Yes, we’ve heard that from our mothers when we were kids, but still, this comes in handy every time we face the dangerous world out there. Based on true accounts of our tellows users, our top three for the week go like this: 1) caller tells you they found your lost debit card and then will ask you to confirm the number to them, the next thing you knew, they’re already using your debit card number for different transactions; 2) scam call pretending to be a representative of Nova Scotia informing you that you just won a free cruise but they first need your bank account details to make sure that they are talking to the right person; 3) another Caribbean spam caller, this time from Montserrat. This entry was posted in general and tagged Harassment calls, Most Wanted, nuisance calls, Scam, scam artist, telephone, telephone scam, top 3, weekly update on Thursday January 16th, 2014 by Grace.